Hack Keele is FREE and open to everyone! We're a society for tech-minded individuals to meet up, learn and create the future of technology! We're a society for tech-minded individuals to meet up, learn and create the future of technology! If you've got an interest in Programming, Coding, Web development, Game development, Cyber Security, Ethical Hacking, Networking, Computing, Artificial Intelligence etc. - you'll fit in perfectly! Hack Keele is FREE and open to everyone, so even if you're not studying Computer Science, we'd love to have you! We'll be organising weekly sessions, socials, study groups, and general meetups. 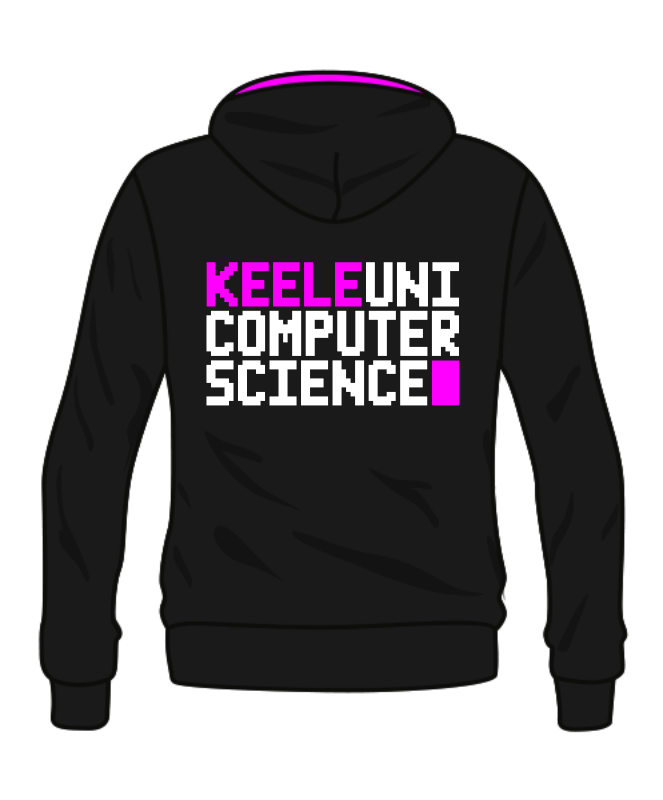 We have a 24hr Hackathon, and a ball in the planning, as well as a few Mini-Hackathons, Careers and CTF (Capture the Flag) events, and of course the new Computer Science Hoodies! We are also avid supporters of Code Club UK, Keele MakerSpace, and CodeUp UK, all of which you can hear more about by visiting our stand at Society Sign Up! Computer Science Hoodies are on sale until 23:59 on Sunday 19th November, so make sure you order one in time! They are available in several colour options, as shown below, and can be customised at checkout (You will need to pick your Hoodie colour, the colour of the design on the back, and can personalise with your name if wanted for no extra cost!). Hoodies are £23.00, and Zipped Hoodies are £25.00. Sizes are from S - XXL (Unfortunately we're limited to these sizes with most colours - If you need anything smaller or larger, send us a message and we'll check availability). 1. Click the 'Products' button at the bottom of the page and add the Hoodie you want to the basket. 2. At Checkout you'll be asked to make your customisations. 3. Orders will be placed with our supplier on Monday 20th November - With an expected delivery before the end of the month! If you are having any issues ordering - send us a message on Facebook or an email to soc.hack@keele.ac.uk.